Have you ever started reading a good book and you neglect everything else in your life until it’s finished??? That was this quilt. I fed my family waffles and eggs for dinner until it was done and literally did nothing else but sew during every baby sleeping time. I wanted to make a pumpkin quilt, but not a Halloween quilt…more like something I could leave out until Christmas. So my pumpkin quilt was designed, pieced, and finished within just a few days. I told you…waffles and eggs…I couldn’t stop with the pumpkin quilt! I’m pretty in love with it. I used a Moda Crossweave for the background. It was my first time using the crossweave as a sashing…and honestly I wouldn’t recommend it even though it’s beautiful. It’s a bit stretchy…and getting everything lined up and perfect made me a bit nutso. Instead I would use a cotton with a linen look, and save the cross weave for smaller areas. I’ll link to the fabrics I used at the bottom of this post. I used this 108″ backing. Isn’t it perfect for a fall-ish Thanksgiving quilt?! I quilted it myself with a gray thread to match the background. Wilson (the cat) isn’t allowed inside the main area of our home because my son is allergic…but he snuck in yesterday morning and I found him in the afternoon cuddled up asleep on the pumpkin quilt. Obviously I couldn’t wake him up…just look at that fuzzy sweet face! There are oodles of pumpkin patterns and blocks out there already, so I debated whether or not to write this up, but I did it anyways…mostly for my Mom (she made the cutest pumpkin pillow to go with it!). The pattern is in my shop here as a PDF, or here as a paper pattern. Oranges: one, two, three, four, five, six, seven, and the others were from my stash (the floral is from Fig Tree quilts Farmhouse collection, the orange Pez print is hard to find but by American Jane for Moda, the light/white orange is Botanics by Carolyn Friedlander). OMG I love this quilt! Stop making such cute patterns! Now I have to order more! Lol…I’m SO sorry! ;) Cause we all need ONE more thing to do this fall right? What a great fall quilt! Congrats on a new pattern! Nothing wrong with eggs and waffles either! So glad you decided to write up this pattern. I love that it’s not Halloween specific and your fabric choices are wonderful. I think this quilt is adorable. I may have to get the pattern and put together a throw quilt….before the end of October….too late for Thanksgiving….perhaps in time for next Thanksgiving. I’M GOING SHOPPING! This is a great fall quilt. Love the pumpkins. This is just about the cutest quilt I have ever seen! I am in love with you new pattern!! I LOVE this pattern! I must stop everything and make it this weekend! Just love this pattern! I like that it’s a fall theme, but not a Halloween theme. Can’t wait to pick fabrics from my stash to use. Thank you. I’m in love! Thanks for publishing the pattern. I appreciate that it’s not Halloween for the reasons you stated. Can’t wait to make it. But, first I need to finish the holiday gifts and get them off to the quilter! Oh, I love all these pumpkins! I too like that it’s pumpkins but not just for Halloween. Soon as I get a chance I’ll have to poke around and check for oranges in my stash and scraps … Because I really need to start a new project. Ha. Ha. Ha. I love this Allison!! I love my fall and love decorating for it. This is an awesome quilt for the fall decor! Love this quilt! I’m like you, I like quilts that are seasonal rather than just for one holiday. After all, we put so much work into it why display it for only a week? ;) I came across the same issues when I used Quilter’s Linen by Robert Kaufman for a quilt, too stretchy and such a pain to line up for the blocks and sashing. I found that if I starched the fabric prior to cutting it made it so much easier to work with. Love, love, love it! It took me about two seconds to buy it yesterday after I saw it on Instagram. It might NEED to happen right away. Glad you decided to publish it so I didn’t have to figure it out myself. Oh man….costumes. I “make” costumes by going to Costco and letting my kids pick out whatever they want to be that Costco has. ;) No really though…I need to learn how to make cute costumes! My Mom made mine when I was little and they were the best! Check out ‘make it love it’ for costumes. Homemade. 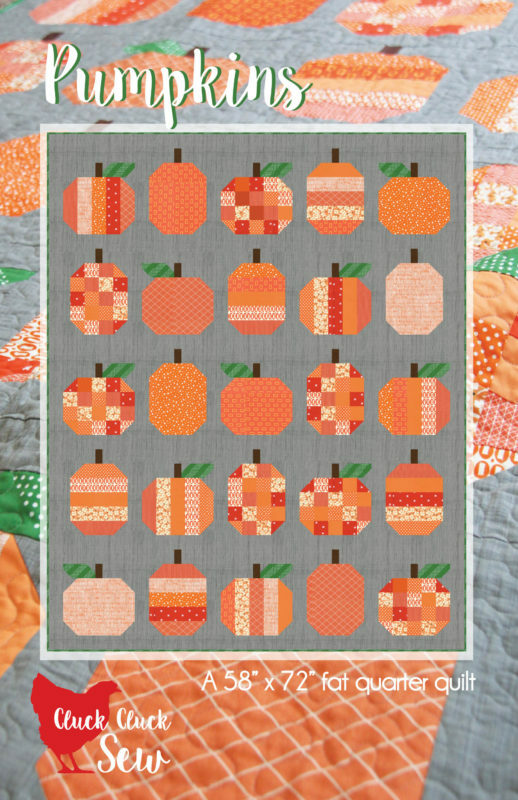 I love this pumpkin quilt and just purchased the pattern. Now to collect fabrics!! Could you please tell me about the green fabric that you used? Thank you. Yep you bet! This is the green: http://www.fatquartershop.com/cotton-steel-basics-picnic-dottie-yardage All of the fabrics I used are linked at the bottom of the post too. Thank you! This is a great weekend, after work project…I hope you love it! Oh, I love it! So very cute! Just too adorable! And there is NOTHING wrong with waffles for dinner–but they have to have blueberries in them here in Maine! Blueberries is the best idea! Oh bummer! Orange is kind of hard to find…which is why I used every single orange I had that I liked and still had to buy 7 more! ;) I took a picture of the pillow, I’ll try to add it to a post soon! I’m in love! Your quilt makes me want to drop everything, pull out my extensive collection of orange scraps, and get to work on a new fall quilt. So, so cute! Super adorable,happy you did do the pattern. I haven’t made a Fall pattern in ages but this is very cute. I might break down and make this one. Thanks for the advice about ‘crossweave’. It sure does look nice though! 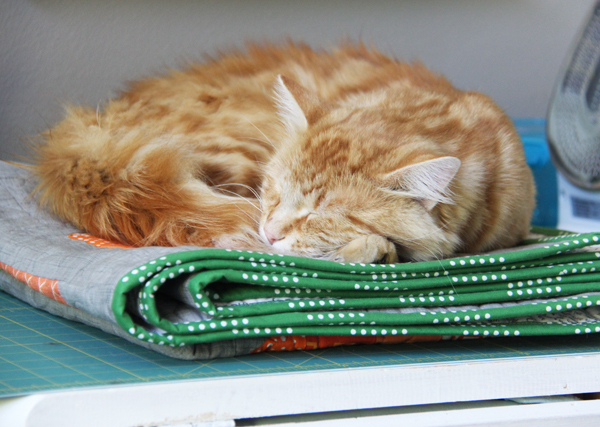 My cat likes to sleep on quilts in progress too. Ooooh Yes! I love these pumpkins. This is so cute and I do not need one more thing to make right now!! Wilson is adorable and he looks so comfy. I’ve had the thimble blossoms flag quilt sitting on my couch since July … I’m need this, stat! Thanks for the great pattern – downloaded it and am cutting into stash today. :) BTW, we have a hypoallergenic kitty that is a Siberian cat … FYI in case you’re a kitty lover like I am. I just love this! But I am just about to start a fall quilt…. What to do? Maybe a table runner for this year and the whole quilt for next year? this is going to be a classic, Allison, you better have a lot printed. It makes me want to start quilting again. I must have this quilt! Love LOVE this quilt! Fall is my very favorite season. 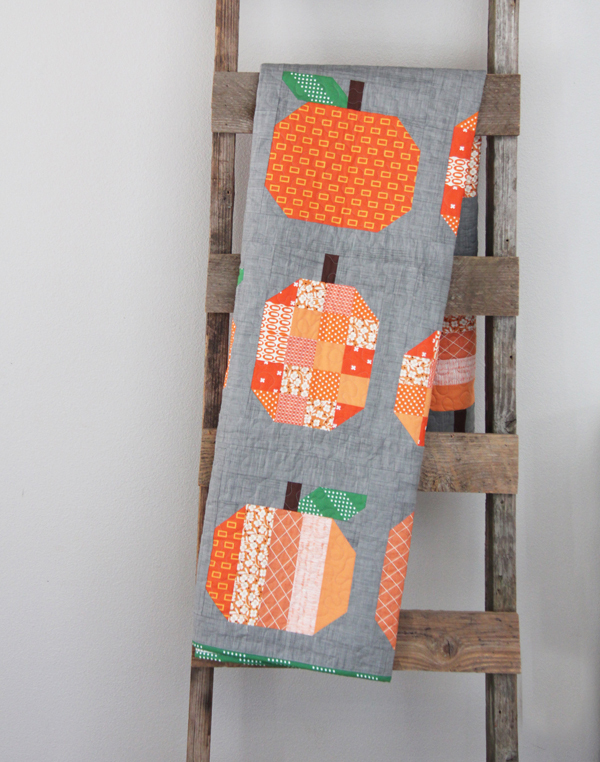 This quilt is perfect for fall and harvest and is happy. 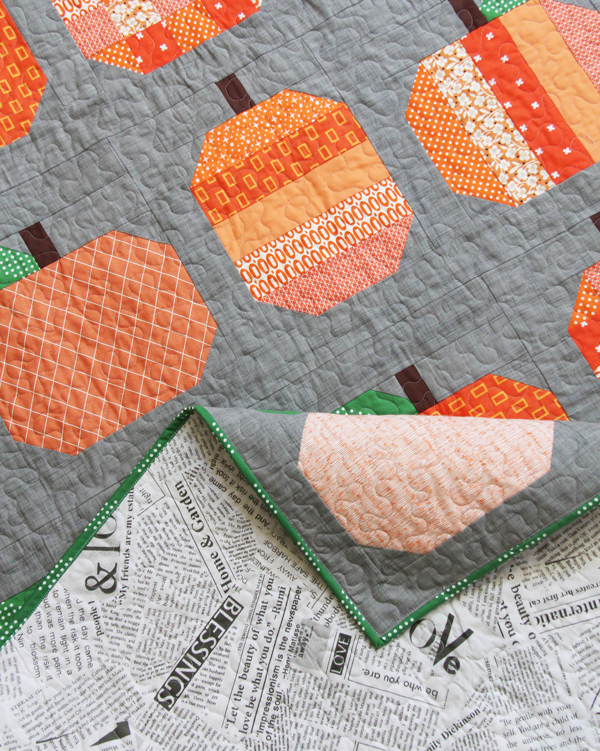 Oh, but that is the perfect, comfy pumpkin quilt Good call on making it up into a pattern! I’ve been thinking about this little pumpkin quilt since the day you posted it. I know just who I am going to make it for! The great pumpkin – quilt! We all love it and thanks for so many tips! I bet your family loved waffles and eggs! Your cat blends in well with it too. Love your posts and now, I need to get busy making this… so glad you came out with it! Had to have it! Such a cute pattern. 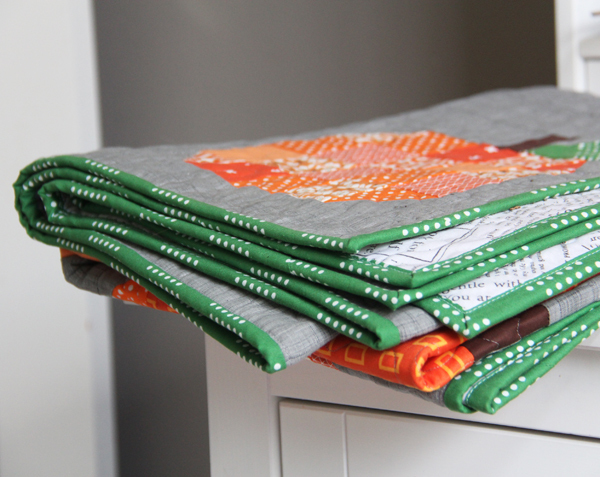 The link for the orange fabric “seven” is no longer available at FQS. Could you tell us what orange fabric #7 is? Your fabric choices are always great! Hi, I can’t wait to start this quilt! Thank you for the pattern. I was looking at Bella solids on Fat Quarter Shop website… can you recommend a gray color to use that would be similar tone to the crossweave you used? Its so hard to tell from the website. Thanks! Hatch in graphite or Essex in graphite? Either of those would be awesome…hatch might be easier to sew with since I believe that’s just quilting cotton? I love you quilt this is the pretties pumpkins quilt I seen!! Thank you for the tips on sharing how you were able to get it done. I was always wondering how you guys sew very fast. I am going to have my husband cook or do what you did to get it done before fall is over. Please post the name of the green fabric. The link doesn’t give the name of Fat Quarter Shop because they are probably sold out. May be able to get it somewhere else at a shop near my home. Thanks!! Did you prewash the crossweave fabric? I read that it shrinks more than the other cottons when you wash the quilt. Nope I didn’t, and honestly it probably would have been a nightmare to sew with if I had pre-washed it. I even added more starch and it was still a bit stretchy…so I wouldn’t recommend prewashing it! Love this quilt, had to get the pattern. Have my rows put together getting ready to sew together the last 12 strips for the sashing, you say on the directions to sew them together end to end. Do you just sew a straight seam across the ends or do you make a mitered seam? 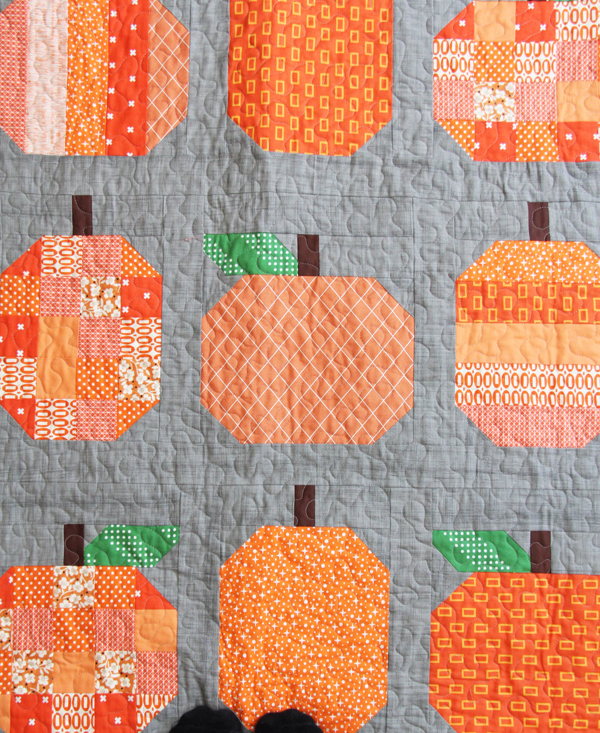 Having so much fun with this quilt and love that it is just fall and not Halloween. Love it, bought it, made it. Such a great pattern thanks! I just ordered moda grunge in grey couture. Hopefully it looks good! Love this! But a quick question….you used 108″ fabric for the back…the pattern calls for 4 yards. Isn’t that a lot of 108″ wide for this quilt back? Is this for 45″ wide fabric? I just want to make sure I am not purchasing too much! Thanks for the great inspiration and the great pattern! YES! That is for the 45″ wide fabric…I don’t include 108″ requirements on the pattern since it’s not as main stream (yet). But you’d need about 2 yards of the 108″. Thanks! Wow! I’ve never made anything in the tube fashion! Cool! Thanks! 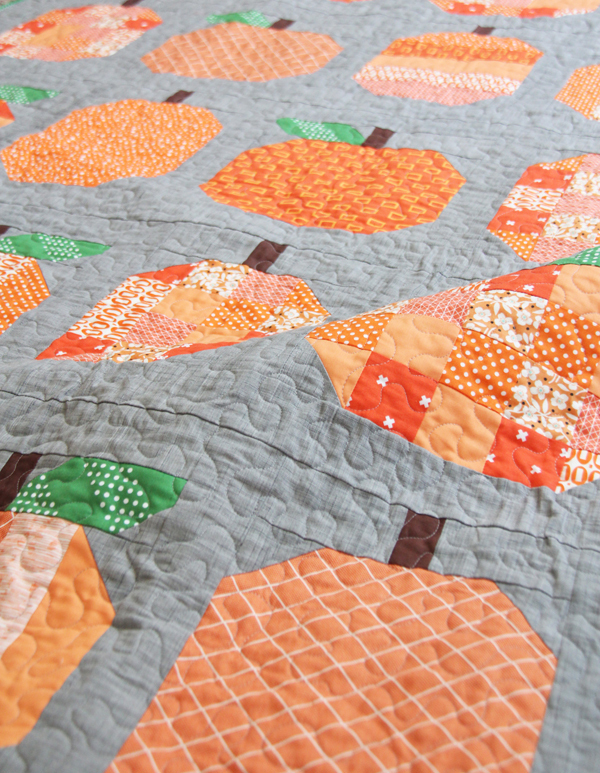 Love the pumpkin quilt.. Plan to make one for next year… Love the fabric also. Not many fabric stores or quilt stores near me. I have to order on line.. I have made several of your patterns for my grandchildren and great grandchilden. I love this! love love love, and I need a gray background pumpkin quilt because my living room is gray, so I will put all my other UFO’s away and start this!! This is the best fall quilt I have seen in many years. You are so talented. Thank you for sharing. You made my day. Love the pumpkins. Just purchased the mini version of the Pumpkin pattern! Cannot wait to make it! Quick question before I purchase this…. How does this compare to your heart quilt in terms of time and difficulty? I made you’re 4.5″ hearts into a twin size quilt and wanted to die lol. It took me forever to finish it and I felt like all I did was make bigger piles and bigger piles until it finally started coming together. I’m afraid of taking on another project of that magnitude. Oh man a tiny heart block in a twin size?! I would die too!!! This one is easier than that for sure. The blocks are big and come together really quickly, and there aren’t as many of them. You’ll be able to make this one faster for sure! It’s a fun sew! 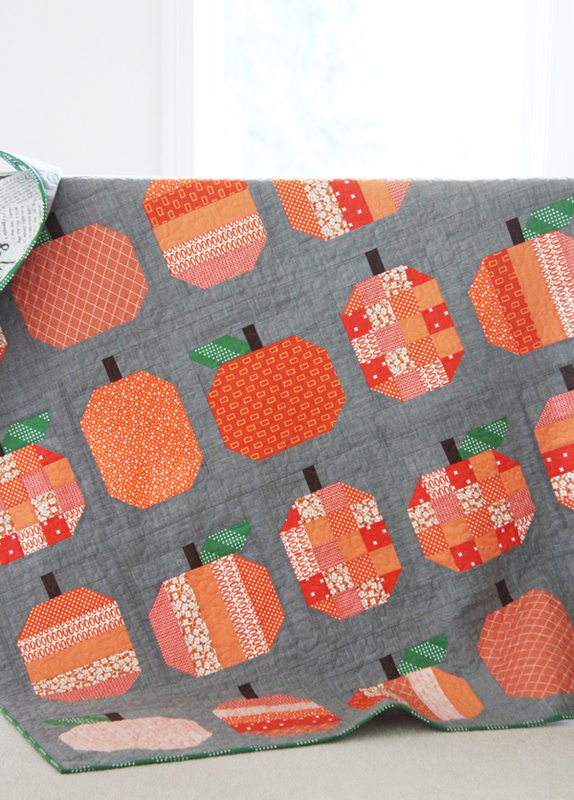 I said I’d never make a holiday quilt…til your Pumpkins quilt! And now I’m doing your No Point Stars pattern, too, in Christmas colors! I love your patterns, Allison! I think I said the exact same thing a few times…and now I have a stack of Holiday quilts. ;) Thank you!